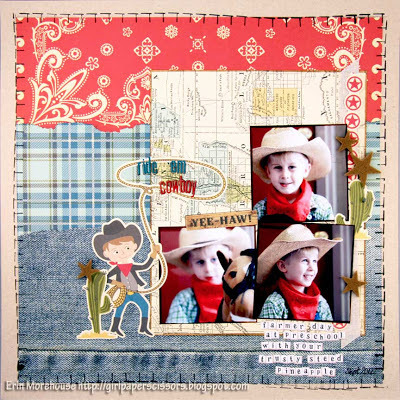 Last week, I shared this layout on LCOM, featuring uses for old and new product. I have tons, and tons of raw chipboard that I bought when I first started scrapbooking, and never had the patience to paint or alter to use on projects. I've got few new tools in my arsenal that make that raw chipboard user friendly. One of those is washi tape! Check out the step by step instructions here. I didn't think there could be any crafting item that could rival my fondness for googley eyes. Then I met the Action Wobble. A simple self adhesive plastic spring that can be added to your paper crafts to give instant fun and movement! 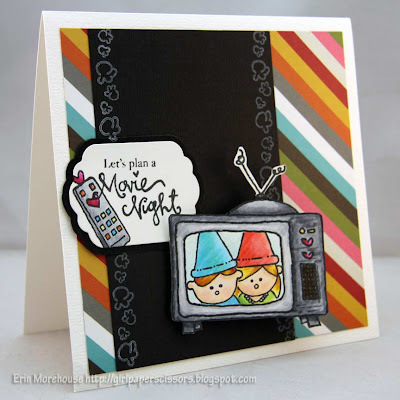 If you want a chance to win some stamps from Sweet Stamp Shop, and a set of springs from Action Wobbles, head over to the Sweet Stamp Shop Blog for details. Every now and again, a collection comes along that just seems perfect for your needs. Sasparilla by October Afternoon was one of those. I just had to get my hands on it as soon as I saw it online. Then a funny thing happened- Once I got it home from the scrapbook store, it sat, and sat. I eventually used it for a layout or two, but nothing that really captured what I had first loved about it all. Then I got down to working with this week's sketch #159 from Let's Capture These Sketches. I pulled out these pictures of my little cowboy, and thought I may as well give the collection another go. Turns out these were the pictures I needed for this all along. Adhesive: I used Helmar Acid Free for the papers and photos, and Helmar 450 Quick Dry for the felt. Why are sunglasses on kids so cute, and just how do they seem to know how cute they look? Rowan has discovered the sunglasses. Every time he comes across them at home, he brings them to me to put them on him. I spent an entire grocery shopping trip wondering why everyone kept looking at my son until I realized he was wearing his sunglasses the whole time. These pictures capture the cuteness of the sunglasses, and the ham that they bring out of Rowan. I used a stamp set from Sweet Stamp Shop all over the layout. 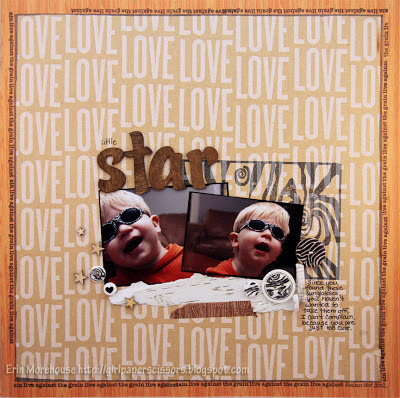 I stamped a large woodgrain stamp directly onto my craft paper using Memento Ink. I love how the white printing on the paper still shows through. I then stamped around the border of my page using the sentiment stamp. Then I broke out the Staz On ink, and smaller round circle stamps to alter some white buttons. I really liked the birch paper from basic grey, and ripped a couple of strips off and rolled the edges securing with a little Helmar 450 Quick Dry before adding them to the page. The Quick Dry is also perfect for heavier embellishments like the buttons, wooden stars and title letters.